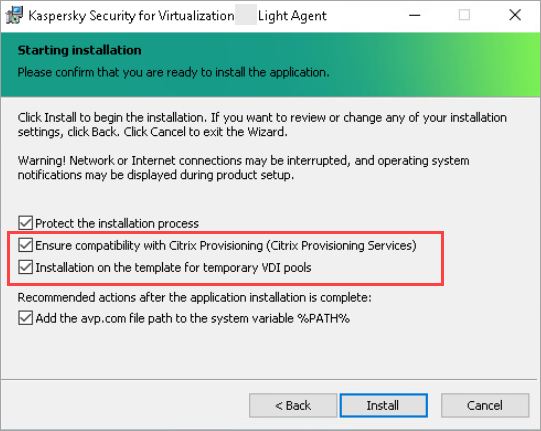 Service Pack 2 Maintenance Release 1 (10.4.343) if you want to use Kaspersky Security for Virtualization 5.x Light Agent with only a standard commercial license. The Kaspersky Security for Virtualization 5.x Light Agent components are installed on the Administration Server. Kaspersky Secure Virtual Machines are installed on all Hyper-Visors that will have VDI machines running and are located in a separate group of managed computers. Create a new group of managed computers. All created Virtual Desktops will be moved into it. Exclude this group from all inherited tasks: Find Vulnerabilities and Window Updates task and Fix Vulnerabilities and required Updates task. 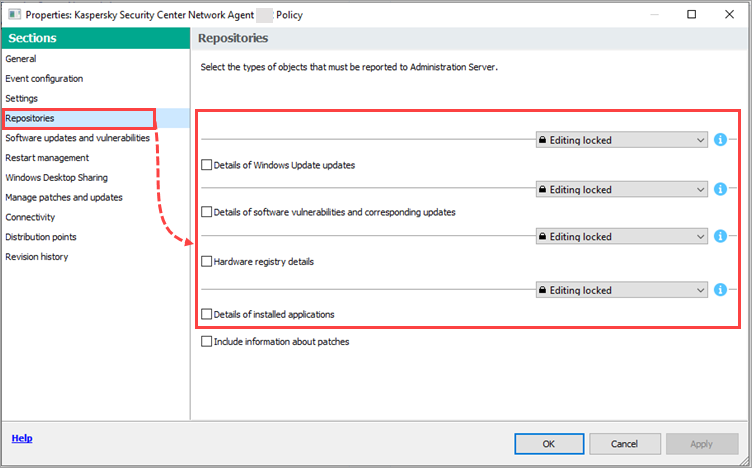 Create a new Network Agent policy. Go to the Repositories tab. Clear all selected options and lock them. Go to Updates and software vulnerabilities. Select Disabled for the Windows Update search mode setting and lock it. Create a Secure Virtual Machine policy in the group of managed computers where SVMs are located. Go to Update settings and clear the Update application modules checkbox. Close the lock. Go to Settings for connecting SVMs to the Integration Server and specify the IP address (or FQND) of the machine with the Integration Server (the IP address of the Administration Server). Close the lock. 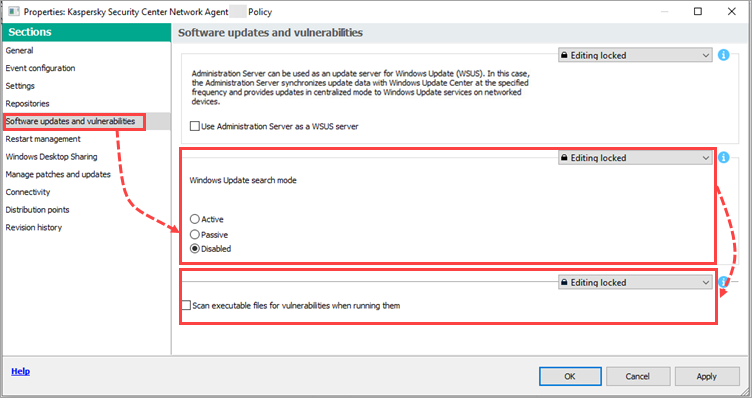 Verify that the policy is applied on the Secure Virtual Machines. 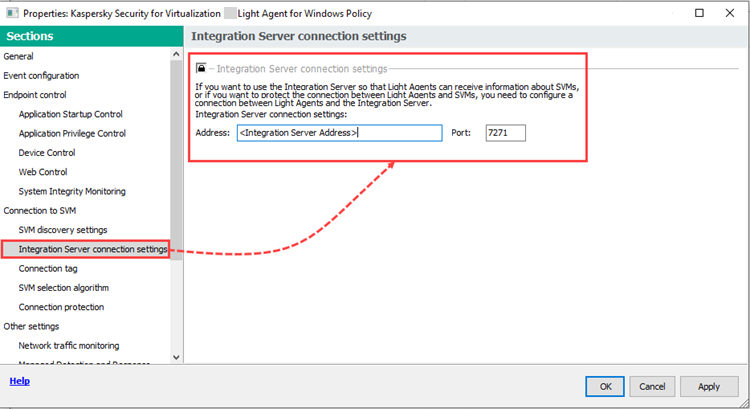 Create a policy for the Light Agent for Windows. Open the policy properties and go to Anti-Virus protection → General Protection settings. In the Exclusions and trusted applications section, click Settings. If the VDI infrastructure is used in a Citrix environment, enable exclusions and trusted applications for Citrix XenDesktop, Citrix Provisioning Services, Citrix XenApp, Citrix EdgeSight, and Citrix Profile Manager. If they're not in the list, create a new policy and add them at the Exclusions step. If the VDI infrastructure is used in a VMware environment, enable exclusions and trusted applications for VMware Tools and VMware Horizon View. If they're not in the list, create a new policy and add them at the Exclusions step. If roaming user profiles are used, specify the path of the network folder where the profiles are located to avoid scanning on both a network and local level. Go to the SVM discovery settings section. Make sure that Use Integration Server is selected and that the lock is closed. Go to Settings for connecting to the Integration Server. Specify the IP address (or FQDN) of the machine where Integration Server is installed (the IP address of the Administration Server). Launch a local installation of Kaspersky Network Agent on the golden image. 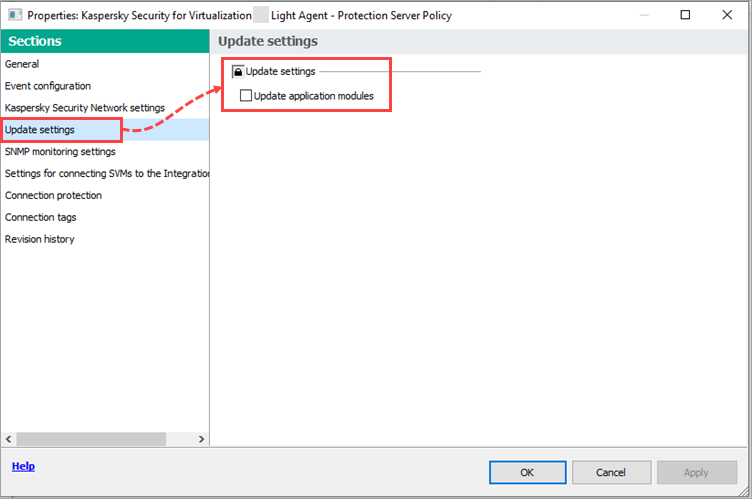 At the Advanced settings step, clear the checkbox Automatically install applicable updates and patches for Kaspersky Security Center 10 components with Undefined status. 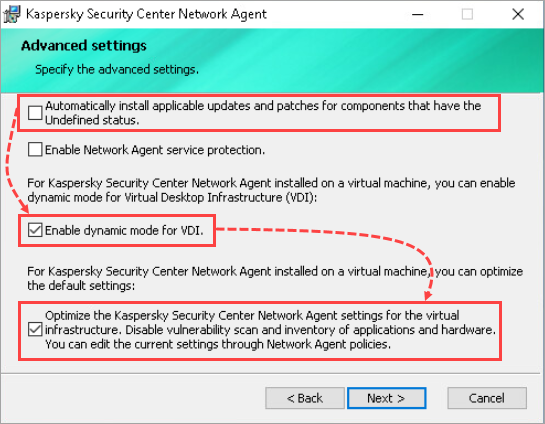 Select the checkboxes Enable Dynamic Mode for VDI and Optimize Kaspersky Security Center 10 Network Agent settings for the virtual infrastructure. Disable vulnerability scan and inventory of applications and equipment. You can edit the current settings by using Network Agent policies. After Network Agent has installed, open services.msc and launch it manually. Launch the local installation of Kaspersky Security For Virtualization 5.x Light Agent on the golden image. If you are using Citrix XenDesktop, select the checkboxes Ensure compatibility with Citrix Provisioning Services and Installation on the template for temporary VDI pools. If you are using VMware Horizon View, select the checkbox Installation on the template for temporary VDI pools. If the checkbox is selected, updates that require a protected virtual machine to restart will not be installed on the virtual machines deployed using this template. At the same time, Kaspersky Security Center 10 will send messages that database and application modules updates are required on the template. Verify that the Windows Light Agent policy has been applied. The golden image should have been handled by relocation rule created in Kaspersky Security Center. If the golden image does not meet the conditions of the relocation rule, move it manually into the managed group created for virtual machines. 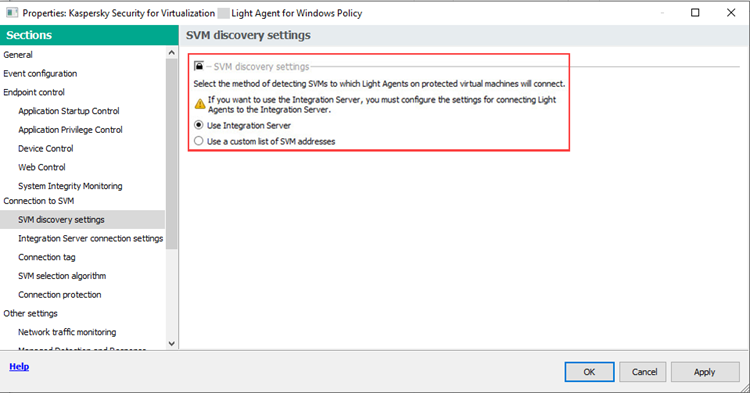 Verify that the Light Agent is connected to the SVM: open thewindow locally in the interface of the Light Agent for Windows. Sign in to the system once it has restarted. Shut down the golden image. You can now deploy VDI machines from this golden image.